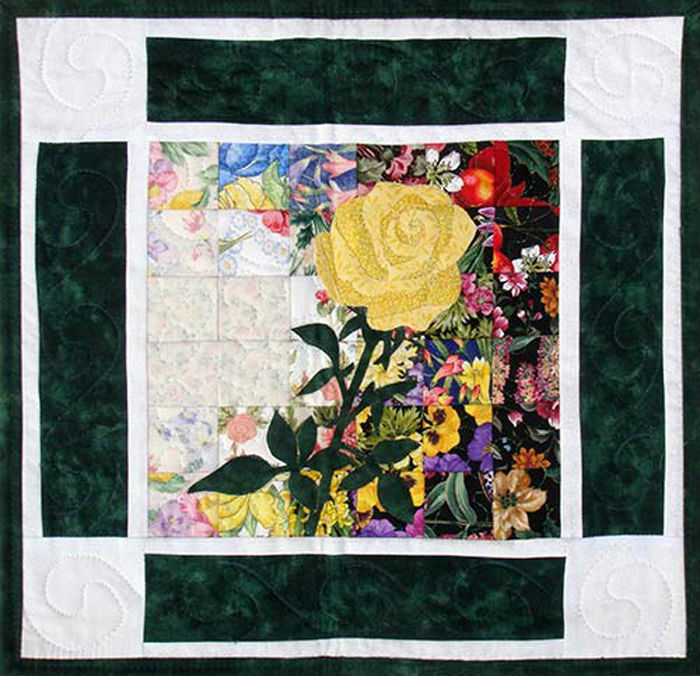 Yellow Rose of Texas watercolor quilt kit designed by Mim Schlabach of Whims Watercolor Quilts. The Yellow Rose stands for friendship! This easy block sized wall hanging pattern is a beautiful reminder of friends far and near and an easy way to learn watercolor quilt making. Kit includes die-cut watercolor fabrics, necessary applique fabrics and patterns, along with detailed instructions and a color photo. The 2" background squares ARE precut. The appliques ARE NOT pre-cut. Border & backing is not included. Finished Size: Approximately 9" x 9" (without border). Skill Level: Advanced Beginner.